Learn to recognize and work with different personality types if you want to master the art of persuasion -- and selling. (1) The Balkers. These people are indecisive. They can't make up their minds. It takes a lot of patience to deal with them. Sooner or later, you have to force the issue by asking, "What would keep you from signing the agreement letter today?" (2) The Talkers. You can control the talkers by asking questions to keep pulling them back on track. Use simple questions they can answer "yes" or "no." (5) The Sarcastic Souls. Sometimes they're hard to take, but keep your cool. Find out what's behind their sarcastic remarks. Laugh at their sarcasm -- all the way to the bank. (7) The Bullies. They get their way by acting tough. Be nice, but stand your ground. Don't run, don't fight -- just stand. (8) The Timid Ones. Take it nice and slow, don't rush them. Concentrate on building their confidence. Remember, clients always do things for their own reasons -- not for yours or mine. You're thinking: I wish this prospect would go ahead and make a decision...I need this agreement...Besides, I've got another appointment! But the client keeps thinking: Why should I spend this much money? Is this the best investment I can make right now? What's the big rush? If you want to move an evasive client to action, you have to give that client a strong benefit for acting promptly. And, here's where you can usually separate the amateurs from the real pros. The amateurs start thinking about discounts -- "I'll give you 10% off if you'll go ahead and sign the agreement today!" But that's not visionary salesmanship, not the high level strategy that works effectively with people who are buying your professional skills. In fact, it often creates precisely the opposite effect from what you want. The client starts thinking: "Maybe this person is not such an expert, after all! He or she must not have much business! Maybe I'd better take a closer look at this whole thing!" Real professionals take the opposite approach. They focus on the client's key benefit for buying immediately. For instance, if the client's problem is costing X number of dollars a month, the real expert will talk about how much it would cost the client to delay solving it for thirty days. Or, if the client is on a tight schedule for delivery, they might say something like this: "Mr. Smith, if we can go ahead and finalize our agreement today, I can guarantee delivery on schedule. But I'm not sure I could promise a definite delivery date if we wait until next week." It's called "hot button" selling, and it works like this. You find the client's primary motivation for buying, and zero in on that motivation. You keep asking questions until you find the prospect's strongest reason for acting promptly, then you reinforce the client's own reason. One of the simplest and most powerful formulas for success I've ever discovered came from Frank Bettger, a man Dale Carnegie called the best salesman he ever met. Frank Bettger said, "Show people what they want most, and they will move heaven and earth to get it." So, I always figure that, if people are not willing to do whatever it takes to get moving, I have not yet discovered and shown them what they want most. When you have done that, you don't have to worry about pinning down evasive clients. They'll pin themselves down. 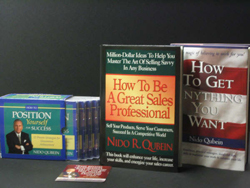 "Nido Qubein's business acumen is demonstrated in this powerfultool box for building effective sales models."